Status: Rare regular spring and fall migrant west, rare casual central, accidental east. Rare casual statewide winter visitor. Documentation: Specimen: UNSM 7242, 11 Sep 1919 Monroe Canyon, Sioux Co (Mickel and Dawson 1920). Migration takes place in May. There are earlier reports 10 Mar 1985 Scotts Bluff Co, possibly a wintering bird, and 21 Apr 1961 Box Butte Co, and a late report 30 Jun 1973 Scotts Bluff Co. There are about 54 reports in all, most from the Panhandle, although a few are from further east: 30 Apr 1974 Perkins Co, 1 May 2013 Perkins Co, 3 May 1955 Keith Co, 15 May 1972 Perkins Co, 31 May 1963 Logan Co, 4 Jun 1985 Lincoln Co, and 6 Jun 1982 McPherson Co. The only report from the east is one at an early date, possibly having wintered, 17 Apr 1984 Dixon Co (George 1984). There are about 32 fall reports, including each of the years 2007-2017. One was in the east 4 Oct 1983 Douglas-Sarpy Cos (Williams 1984). There are later dates 28 Sep 2003 Wind Springs Ranch, Sioux Co, 5 Oct 2013 Scotts Bluff Co, and 16 Oct 1985 Scotts Bluff Co. Additional reports east of the Panhandle are 5 Sep 1969 McPherson Co, and 14-16 Sep 1971 Perkins Co.
Winter: This species has a tendency to winter at feeders east of its regular range; all but one of the winter records are in this category. One was at a Lincoln, Lancaster Co feeder during the last two weeks of Feb 1978 (Williams 1978), and three appeared in the east during the following winter, including one in Lincoln, Lancaster Co (Williams 1980), one at York, York Co, and another at Raymond, Lancaster Co (Williams 1980). The latter spent 5 Jan-17 Apr 1980 at a feeder one mile east of Branched Oak Lake, and was banded by Ruth Green 24 Feb (Manning 1980, Cortelyou 1980); another, possibly the same, wintered there 1 Nov 1984-2 Mar 1985 (Cortelyou 1985a, Cortelyou 1985b). The single winter record from the Panhandle was of one in Carter Canyon, Scotts Bluff Co 5 Jan 2013. Of interest was a note in the Omaha World Herald 12 Jan 1919 that “a specimen of this beautiful species was found, dead, in the snow along “Billy” Marsh’s winter shack on Carter lake, only last week.” (Miles Greenleaf, fide James Ducey). The specimen apparently was not kept, but if the identification was correct, it was the first record of the species for Nebraska. 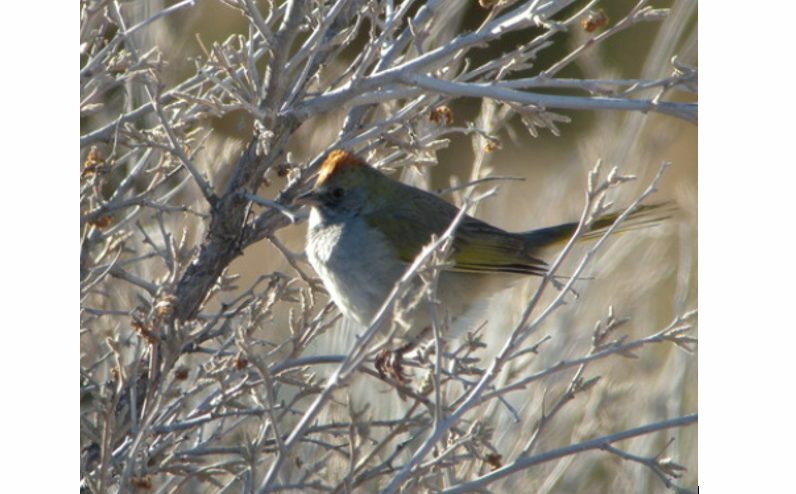 Photograph (top) of a Green-tailed Towhee in Scotts Bluff Co 4 Jan 2013 by Paul Dunbar. Cortelyou, R.G. 1985a. 1984 (Twenty-seventh) Fall Occurrence Report. NBR 53: 5-18. Cortelyou, R.G. 1985b. 1985 (Sixtieth) Spring Occurrence Report. NBR 53: 50-66. George, A. Dixon County. 1984. NBR 52: 68. Grzybowski, J.A. 1994. Southern Great Plains Region. American Birds 48: 313-315. Manning, R. 1980. Green-tailed Towhee. NBR 48: 89. Williams, F. 1978. Southern Great Plains Region. American Birds 32: 368-373. Williams, F. 1980. Southern Great Plains Region. American Birds 34: 286-288. Williams, F. 1984. Southern Great Plains Region. American Birds 38: 218-221.